That is largely the case with these figures for the three months to 31st December 2011 (and therefore the first half of 2011/12 too). Having said that, there are some surprises. The trends seen in the first quarter figures were present again in Q2. Matchday income was up 3.8% compared to last year despite exactly the same number of home games. The club put through an average price increase of 2.5% this season and the additional revenue has come from better corporate hospitality sales, a real credit to the Old Trafford corporate sales team at what is obviously a very difficult time economically. Media income rose an impressive 9.8%, but this increase is somewhat deceptive. United benefit this season from a higher share of the English "market pool" than in 2010/11 because of winning the league last season. Furthermore, the club recognises some of the Champions League media income evenly over the number of games played in the competition. With United being knocked out at the group stages, there is a paradoxically higher amount of revenue recognised in the first six months than last season (when income was spread over ten games across the whole season, not six in the first six months). In the second half of the season, there will be no Champions League income of course and the meagre pickings from the Europa League (a maximum of about €5m if the final is reached) will depend of course on progress in that competition. Commercial income continues to grow very fast (up 13.4% during the quarter vs last year and up 17.7% over the six months). Much of this growth comes from the c. £10m per annum DHL training kit deal. The club has also recently signed new deals with Bulgarian and Bangladeshi telecom operators. This strategy of finding a local telecom partner in a myriad of markets will eventually reach a natural end of course, but I must confess to having been too cautious on United's commercial growth. The "brand" has stretched far further than most observers (including this one) felt was possible. In total, revenue growth of 12% in the first six months of the year is very impressive, even if the impact of the early Champions League exit is yet to be felt. It's a good thing that United's top-line is growing so well, because so is the cost base, and particularly the wage bill. After the 12.2% year-on-year growth in staff costs in Q1, they rose 17.2% in Q2. This increase is before any end of season bonuses obviously, so can only be put down to significantly more expensive deals for key players. When you consider that Garry Neville, VDS, O'Shea, Brown, Obertan and Scholes (his return is not included in these figures) all left the club in the summer with younger (and you would imagine cheaper) players coming in, the wage inflation is even more extraordinary. Historically, there has been a very, very strong correlation (r squared of 0.98) between media income and wages at United. What has happened this season is effectively a breakdown in that relationship.There is no big new TV deal to drive player salaries up. Endemic wage inflation is THE financial problem in football, it is what Financial Fair Play is designed to deal with. These figures show it remains a huge issue in 2011/12. Non-staff cash costs rose an equally punchy 14% in Q2 vs. last year. Some of this must be the club's swanky new corporate offices in Stratton Street in central London. Unlike at the old Pall Mall office, the club has the confidence in Stratton Street to have their name listed in reception. With revenue up 8.7% and costs up 16.3% during Q2 vs 2010/11, EBITDA was virtually static (up 0.4%) and the margin was down from 48% to 44.4%. For the first half as a whole, EBITDA was up 7.7%. United remain very profitable, but the negative "jaws" between cost and revenue growth (costs are rising faster than income) is a worry in any business. Below EBITDA, depreciation and player amortisation were virtually static. 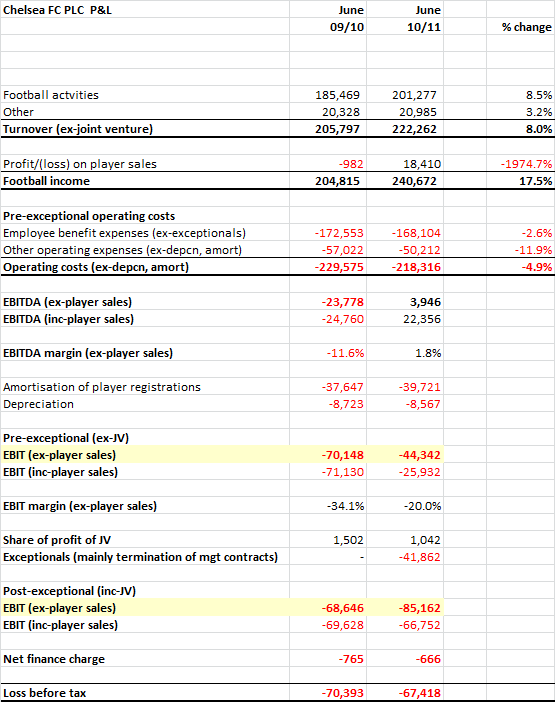 The club made its usual small profit on player sales and there was a totally unexplained £2m exceptional charge. The interest charge in the profit and loss account was down 11% compared to Q2 last year. This reflects the increasing number of bonds the company has bought in during the last two years. It should be noted that actual bond cash interest payments are made twice a year in February and August. Under International Accounting Standards, Red Football must recognise the initial discount on bonds over their life, any premium paid when buying bonds, any "mark to market" increase or fall in the sterling value of the US$ bonds and must also mark any swaps to market too. I don't consider any of these (largely non-cash) charges to be material to the health of the business. The second quarter is not a big one for seasonal cash flow (pre-payments of season tickets and sponsorships unwind over the quarter). 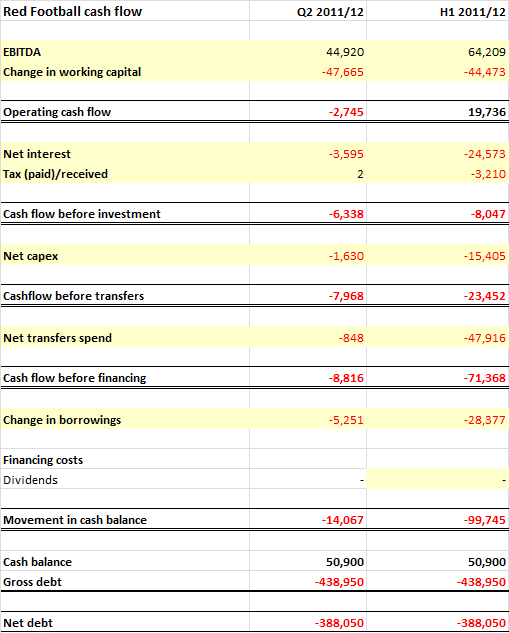 Operating cash flow was slightly negative (-£2.7m) as these working capital positions unwound. 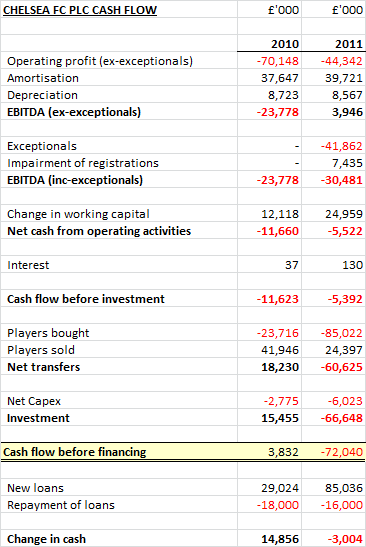 As stated above the main bond interest payments fall outside this quarter and there was little transfer cash flow outside the window.The club bought another £5.2m of bonds during the quarter to take the total to £92.8m (almost 20% of the bonds issued in 2010). 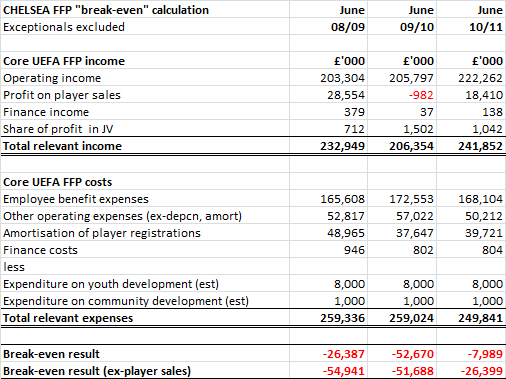 The press have focused on the c. £100m fall in the club's cash balance, but £86m of this fall took place in Q1. In Q2 the cash outflow was only £14m. The cash outflow and bond buybacks left gross debt at £439m and cash at £50.9m. Net debt has therefore risen slightly from £368m at the end of September to £388m at the end of December. Credit has to go to the club for once again boosting revenues in a tough economic climate. United (along with Real, Barcelona and Bayern) is one of the commercial giants of modern football. Much though it pains me to say it, the Glazers have overseen extraordinary commercial growth (this year Commercial income will be more than 2.5x the level the plc achieved in their best year). The second half will see weaker media income as the CL exit bites, a timely reminder that on-pitch success is never guaranteed. 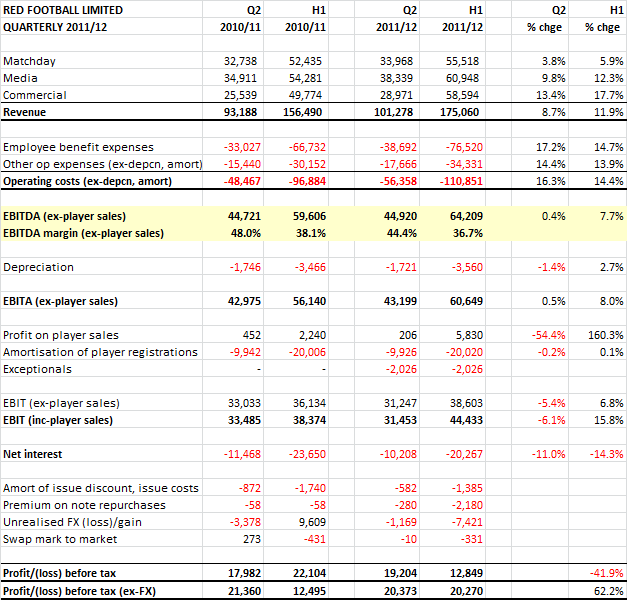 Despite United's excellent revenue growth, the dynamics of football finance remain awful (hello Rangers, hello Pompey). Any business which sees core cost growth of 16% year-on-year is going to struggle to meaningfully grow profits. Profit growth is not crucial for a football club, but it is for the owners who are no doubt still eyeing an IPO and want to tell a story of rising profits, not just revenue growth. I remain confident that FFP will eventually calm player wage inflation but such restraint is not visible in these figures. 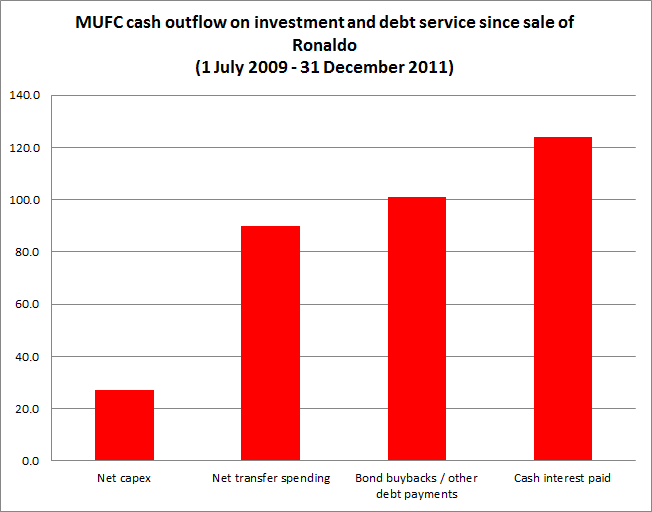 Finally, for all the booming income and soaring wages, there can be no doubt whatsoever that the £116m Ronaldo/Aon windfall received on 30th June 2009 has gone to deal with the debts laden on the club. In the thirty months from that date 31st December 2011, the club spent the following on debt service and investment. 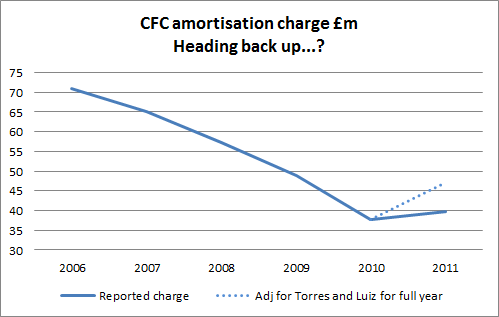 In almost all football clubs, surplus cash is reinvested. At Manchester United it is still far more likely to be spent dealing with debts that the club should never have had.